Parenting books are so hit and miss. Parenting is a universal experience because it is both incredibly difficult and amazingly rewarding. But so many of the particulars depend on your and your children and your unique personalities and circumstances. There were some things I really appreciated about Loving the Little Years and then there were some parts I could have done without. The first thing to know is that this is the perfect read for the parent who only finds a few minutes to read in between diaper changes and refereeing disputes over Legos. The book is divided into short sections. Each section is just a few pages. Jankovic looks at topics like teaching our children to manage their emotions, watching the way we speak around our children, and viewing your children as individuals instead of a collective circus. From the first pages, you know that she is going to be a writer you can relate to - she opens the book by writing, "I didn't write this book because mothering little ones is easy for me. I wrote it because it isn't. I know that this is a hard job, because I am right here in the middle of it." The short sections have their merits, but they unfortunately leave the sections feeling unconnected to each other. Some of the sections themselves feel like unfinished thoughts. Ultimately, I felt as if Jankovic could have benefited greatly from a strong editor to pull her ideas together in a more polished and cohesive manner. I did take away some good advice, though. The best thing I gleaned from this slim book is something that I need to remind myself of just about every day. Jankovic reminds us that we are often focused on just this day and the ways in which our child is disobeying or falling short of what we would like them to do. It's so easy to forget that the thing we are repeating a million times a day ("Please turn out the light when you are done in the bathroom! Why are your socks on the floor? You can't leave your toys on the stairs.) are not the same things we were repeating two weeks or three months ago. It's easy for us to forget the progress that our children have made when we focus on the current issues. 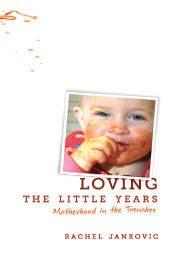 Loving the Little Years is a good choice for the harried parent to read, a little bit at a time. While you may not agree with or be able to use every piece of advice, it's always nice to have a reminder that you are not alone in the craziness of parenthood. It's Monday and it's been a very different week! It's Monday - look at all the books I read!